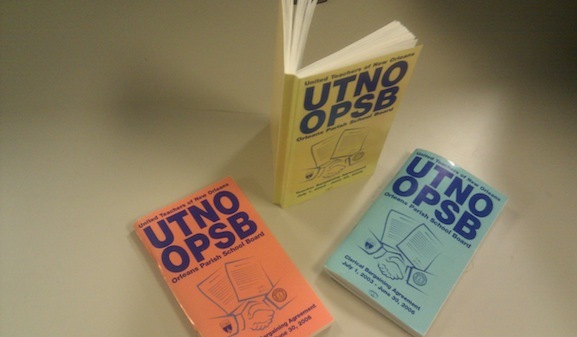 UTNO's handbooks, full of onerous work rules, are cited by critics as out of step with charter autonomy. In an attempt to organize and rebuild its profile, the city’s teachers union has requested teachers’ names and contact information, employee handbooks, and charter agreements from 35 of the city’s 70-plus charter schools. United Teachers of New Orleans (UTNO) president Larry Carter said his office requested teachers’ contact information mainly because he wants to spread the word about the union’s professional-development programs. But he also plans to use the data to build a file on each school. “We’re trying to find out who’s in the buildings, and how many people are in the buildings, for the point of organizing,” he said. It’s the first time the union has requested this kind of information since most of the city’s public schools became charter schools shortly after Hurricane Katrina, Carter said. Once one of the most powerful unions in the state, with about 5,000 members before the storm, UTNO was crippled after the state took over most of the city’s schools, and the Orleans Parish School Board chose not to renew its collective bargaining agreement, which expired in 2006. Renegotiation talks fizzled in the years following, with the local school board again voting down collective bargaining in 2008. The failed agreement would have covered only the handful of schools the board still manages directly. The vast majority of city schools—those in the Recovery School District, as well as the city’s charters—don’t bargain with the union. Today, UTNO says it has about 800 members. (It did not respond to inquiries about how much members pay in dues.) The union has moved from once-sprawling digs on Paris Avenue that doubled as a teacher resource center, to a smaller office in a strip mall next door. With the loss of thousands of members after Katrina, “we could no longer afford it,” Carter said. The national organization, the American Federation of Teachers, helped UTNO pay the bills at the Paris Avenue location right after the storm, he said, and in 2008, they sold the building to the city. Carter thinks it’s time for a resurgence of collective bargaining, even though the city’s decentralized education landscape would most likely require him to secure separate agreements with each charter operator. It’s a campaign he’s willing to mount. “If there’s no opportunity for teachers to have real input at the school-site level, there’s really no opportunity for school-site success,” he said. Though Carter maintains that the union’s teacher-training programs don’t focus on recruiting or promote collective bargaining, eyebrows are likely to rise over any attempt at union outreach. Many school leaders remember the union’s half-inch thick book of work rules and say they just won’t work in a system dominated by autonomous charters, each of which sets its own guidelines for employees. Barbara MacPhee, former principal of New Orleans Charter Science and Math High School is one of them. MacPhee spent 50 years in New Orleans education, and can well remember their frustrating constraint of teachers and administrators. Teachers assigned to morning or afternoon duty were required to stay 10 minutes before or 10 minutes after school, according to the last UTNO rulebook. Teachers not on duty were asked to come to school 10 minutes early. It’s these rules that charter schools, by design, should be free of, MacPhee said. Carter has heard these criticisms before—both that the rules were too burdensome and also that the union defended incompetent teachers from discipline or dismissal. “I think it comes from those principals … who said that when there were changes that they wanted to make, because there was a union collective bargaining agreement, it prevented them from making those changes rapidly, or they couldn’t get rid of the so-called ‘bad teachers.’ It took a lot longer to do that because there was a contract in the way,” he said. But the union also served as a watchdog, stopping administrators from abusing teachers and giving teachers a voice on the important issues, Carter said. With the rise of charter schools and the absence of collective bargaining, teachers who are having problems with their supervisors have no place to turn, he said. That said, Carter stressed that his teacher-training initiative is not a forum in which UTNO will advocate for a return to collective bargaining. It’s part of the union’s mission to help equip teachers for the classroom, he said. Union representatives routinely give schools flyers advertising such programs, but Carter wasn’t sure if teachers at the 35 charters targeted were getting the information. Hence the effort to develop teacher contact information. His staff frequently offers training at schools run directly by the Orleans Parish School Board and the Recovery School District, but charter school teacher participation has been less than he’d like. The union’s effort to develop a charter school data base seems to have caused a stir in on at least one campus – likely because UTNO asked for copies of employee handbooks and charter agreements. The board of McDonogh City Park Academy recently met in a closed session to discuss the request, citing a provision in open-meetings law that allows boards to exclude the public from collective bargaining strategy discussions. Teachers themselves at another school were wary, for whatever reason, of being contacted by the union – only four of New Orleans Military and Maritime Academy’s 26 staffers gave Principal Cecilia Garcia permission to release their information. Crescent City Schools CEO Kate Mehok also received a union request for information. Both she and Garcia said they put union flyers in teacher mailboxes and on bulletin boards whenever representatives drop them off. UTNO’s teacher-training sessions may be undersubscribed in part because many charters offer strenuous professional-development sessions of their own. Mehok’s faculties at Harriet Tubman Charter School and Akili Academy participate in 44 days of training per year, she said. The five-school ReNEW Schools network, which also received a union request for information, schedules teacher training for three hours each Friday, and for 10 full days throughout the school year. They also offer 90-minute sessions one evening each month, according to information provided by a ReNEW spokeswoman. Teachers who attend the union’s weekly professional development sessions have generally positive comments about the program. At a Saturday training session, teachers went over differentiated instruction – a teaching method that caters to a student’s preferred mode of learning – and created “choice boards,” a work chart with nine tasks that cater to nine different student learning styles. UTNO served breakfast and lunch, and passed out certificates of completion at the program’s end. Teachers do not have to be union members to participate, representatives said. During the two hours that a Lens reporter spent at a recent training session there was no talk of organizing. “They’re very encouraging,” said Julie Alexander, a special education instructor at Esperanza Charter School. “I like that. They’re very positive.” Saturday was Alexander’s first time attending a session. Michelle Hudson, a middle school teacher at Dwight D. Eisenhower Academy for Global Studies, is a regular at the sessions. “I can come, I can get more resources for my kids, and you’re not pressured to join the union,” she said. Hudson taught in the city prior to Katrina, and was a union member then. She rejoined after she began attending the union’s professional development sessions. The school will collectively bargain with teachers after 85% said they wanted to join a union.